USES: This medication is used to treat anxiety. It may help you think more clearly, relax, worry less, and take part in everyday life. It may also help you to feel less jittery and irritable, and may control symptoms such as trouble sleeping, sweating, and pounding heartbeat. 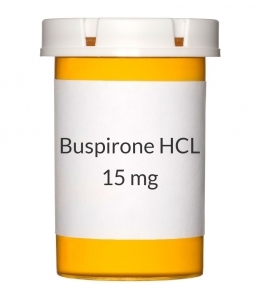 Buspirone is a medication for anxiety (anxiolytic) that works by affecting certain natural substances in the brain (neurotransmitters). HOW TO USE: Take this medication by mouth, usually 2 or 3 times a day or as directed by your doctor. You may take this medication with or without food, but it is important to choose one way and always take it the same way so that the amount of drug absorbed will always be the same. Buspirone may come in a tablet that can be split to get the correct dose for you. Follow the manufacturer's Patient Instruction Sheet or ask your pharmacist how to split the tablet to get your dose. Limit the amount of grapefruit you may eat or drink (less than one quart a day) while being treated with this medication unless your doctor directs you otherwise. Grapefruit may increase the amount of buspirone in your bloodstream. Consult your pharmacist or doctor for more information. Dosage is based on your medical condition and response to therapy. Use this medication regularly in order to get the most benefit from it. To help you remember, use it at the same times each day. When this medication is started, symptoms of anxiety (e.g., restlessness) may sometimes get worse before they improve. It may take up to a month or more to get the full effect of this medication. Inform your doctor if your symptoms persist or worsen. SIDE EFFECTS: Dizziness, drowsiness, headache, nausea, nervousness, lightheadedness, restlessness, blurred vision, tiredness, and trouble sleeping may occur. If any of these effects persist or worsen, notify your doctor or pharmacist promptly. Remember that your doctor has prescribed this medication because he or she has judged that the benefit to you is greater than the risk of side effects. Many people using this medication do not have serious side effects. Rarely, patients taking buspirone may develop movement disorders such as shakiness (tremors), muscle stiffness, mask-like facial expression, jerky walking movements, or a condition known as tardive dyskinesia. In some cases, these conditions may be permanent. Tell your doctor immediately if you develop any unusual/uncontrolled movements (especially of the face, mouth, tongue, arms, or legs). Seek immediate medical attention if any of these rare but serious side effects occur: easy bleeding/bruising, shortness of breath, chest pain, fast/irregular heartbeat. A very serious allergic reaction to this drug is unlikely, but seek immediate medical attention if it occurs. Symptoms of a serious allergic reaction may include: rash, itching/swelling (especially of the face/tongue/throat), severe dizziness, trouble breathing. This is not a complete list of possible side effects. If you notice other effects not listed above, contact your doctor or pharmacist . In the US - Call your doctor for medical advice about side effects. You may report side effects to FDA at 1-800-FDA-1088. In Canada - Call your doctor for medical advice about side effects. You may report side effects to Health Canada at 1-866-234-2345. PRECAUTIONS: Before taking buspirone, tell your doctor or pharmacist if you are allergic to it; or if you have any other allergies. This product may contain inactive ingredients, which can cause allergic reactions or other problems. Talk to your pharmacist for more details. This medication should not be used if you have certain medical conditions. Before using this medication, consult your doctor if you have: kidney problems, liver problems. Before using this medication, tell your doctor or pharmacist your medical history, especially of: bipolar disorder (manic-depression), Parkinson's disease. This drug may make you dizzy or drowsy. Do not drive, use machinery, or do any activity that requires alertness until you are sure you can perform such activities safely. Limit alcoholic beverages. If you are taking other medications for anxiety, do not suddenly stop them unless directed by your doctor. Buspirone will not prevent withdrawal symptoms from other medications, and your dose may need to be lowered slowly when you switch to buspirone. Discuss your treatment plan with your doctor. If you experience withdrawal symptoms, tell your doctor immediately. During pregnancy, this medication should only be used when clearly needed. Tell your doctor if you are pregnant before using this medication. Discuss the risks and benefits with your doctor. It is unknown if this drug passes into breast milk. However, similar drugs pass into breast milk and may have undesirable effects on a nursing infant. Consult your doctor before breastfeeding. DRUG INTERACTIONS: Your healthcare professionals (e.g., doctor or pharmacist) may already be aware of any possible drug interactions and may be monitoring you for it. Do not start, stop or change the dosage of any medicine before checking with them first. Buspirone should not be used with MAO inhibitors (isocarboxazid, linezolid, methylene blue, moclobemide, phenelzine, procarbazine, rasagiline, selegiline, tranylcypromine). Do not take buspirone within 2 weeks before, during and after treatment with MAO inhibitors. In some cases, a serious, possibly fatal, drug interaction may occur. Before using this medication, tell your doctor or pharmacist of all prescription and nonprescription/herbal products you may use, especially of: alcohol, antidepressants (e.g., SSRIs such as fluoxetine, tricyclic antidepressants such as amitriptyline/nortriptyline, trazodone), benzodiazepines (e.g., lorazepam, clonazepam, diazepam), haloperidol, drugs that slow down the removal of buspirone from your body by affecting certain liver enzymes including azole antifungals (e.g., itraconazole, ketoconazole), macrolides (e.g., erythromycin), ritonavir, nefazodone, diltiazem, verapamil, drugs that speed up the removal of buspirone from your body by affecting certain liver enzymes including rifamycins (e.g., rifampin, rifabutin), corticosteroids (e.g., dexamethasone), and certain anticonvulsants (e.g., carbamazepine, phenytoin, phenobarbital). Tell your doctor or pharmacist if you also take drugs that cause drowsiness such as: certain antihistamines (e.g., diphenhydramine), anti-seizure medications (e.g., valproic acid), medicine for sleep or anxiety (e.g., alprazolam, flurazepam, zolpidem), muscle relaxants, narcotic pain relievers (e.g., codeine), psychiatric medications (e.g., risperidone). This document does not contain all possible interactions. Therefore, before using this product, tell your doctor or pharmacist of all the products you use. Keep a list of all your medications with you, and share the list with your doctor and pharmacist. NOTES: Do not share this medication with others. Keep all regular medical and laboratory appointments. If you are also taking trazodone, liver function tests may be performed regularly to check for side effects. Consult your doctor for more details. STORAGE: Store the US product in a tightly closed container at room temperature below 86 degrees F (30 degrees C) away from light and moisture. Store the Canadian product in a tightly closed container at room temperature 59-86 degrees F (15-30 degrees C) away from light and moisture. Do not store in the bathroom. Keep all medicines away from children and pets. Do not flush medications down the toilet or pour them into a drain unless instructed to do so. Properly discard this product when it is expired or no longer needed. Consult your pharmacist or local waste disposal company for more details about how to safely discard your product.